From July 10-19, the United Nations is hosting its annual High Level Political Forum (HLPF) on sustainable development. This series of meetings marks almost 2 years since the 2030 Sustainable Development Agenda was adopted by more than 190 countries. Gathering world leaders annually since then in the United Nations New York City headquarters, this conference is a chance for countries and organizations to review their progress on the 17 Sustainable Development Goals (SDGs). It’s also a chance for all of us – as citizens of our respective countries – to pay attention to what our leaders are doing and saying about their commitments on our behalf. Established in September 2015, the SDGs – also known as the Global Goals – are a global to-do list of our collective commitment to ending poverty, protecting the planet and ensuring prosperity for all. 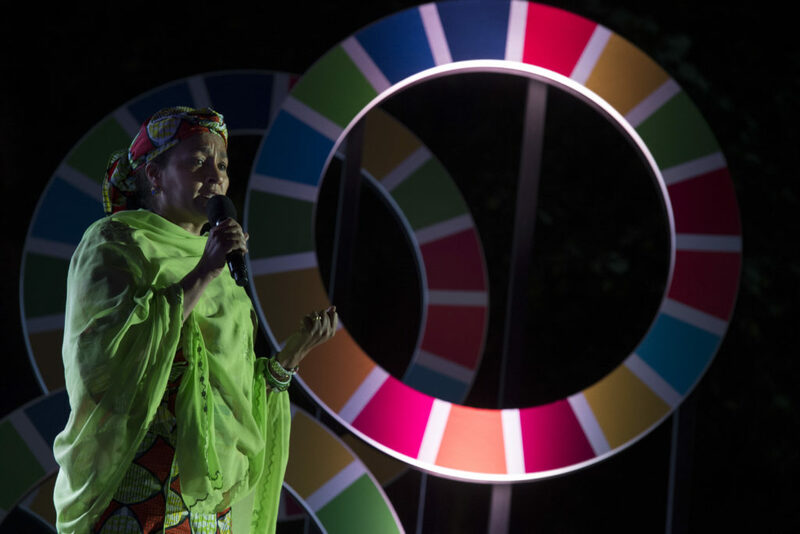 Aminia Mohammad, Deputy Secretary-General of the United Nations speaking at the 2015 Global Citizen Festival in New York City. Goal 17. Strengthen the Global Partnership for the SDGs. Fourty-four countries have committed to sharing reports on their individual SDG progress and will be presenting them at the forum. But beyond these 44 countries, governments will be joined by businesses, non-governmental organizations (NGOs) and a wide array of other community groups and foundations to create a meaningful space for conversation and connections. This meeting is not only a chance for countries to share their progress and for us to hold them accountable to their commitments, but it is also an opportunity for partnership – for different industries to share ideas and mobilize action towards a more sustainable future. The SDGs belong to everyone, and we all have a stake in their success. We play an equally important role in achieving the Global Goals! Chloe Bousquet-Chavanne is a public affairs intern at the UN Foundation. She is passionate about women’s empowerment and equal rights, and a strong believer in the power of storytelling for social good.